I last left you with my going to bed in Osaka the evening of August 5th, I believe. Well, the next morning we woke up and puttered around a bit before heading out to 四天王寺 (Shitennouji), which is the oldest temple in Japan. The weather was hot, hot, hot, and we didn’t last very long in the sunlight. We found a place in the shade to rest and determine what our next move would be. We decided it would be a good time to start heading towards Nara, which was the next stop on our tour in Kansai. We picked up our luggage, said goodbye to Masa, and caught the train to Nara. The hostel we stayed at in Nara was called Guest House Nara, which was amazing! It used to be a theater, apparently, before the current owners got a hold of it and remodeled it into a hostel. The owners were extremely nice, and loved practicing their English on us. They told us that we were just in time, for there was a special lantern festival happening in the city during our stay, called なら燈花会 (Nara Tokae). At the hostel we met some neat people, who we invited to grab dinner and check out the festival with us. We bought dinner at a nearby supermarket and took it to the hostel to eat, then we grabbed our cameras and set off to see the festival! 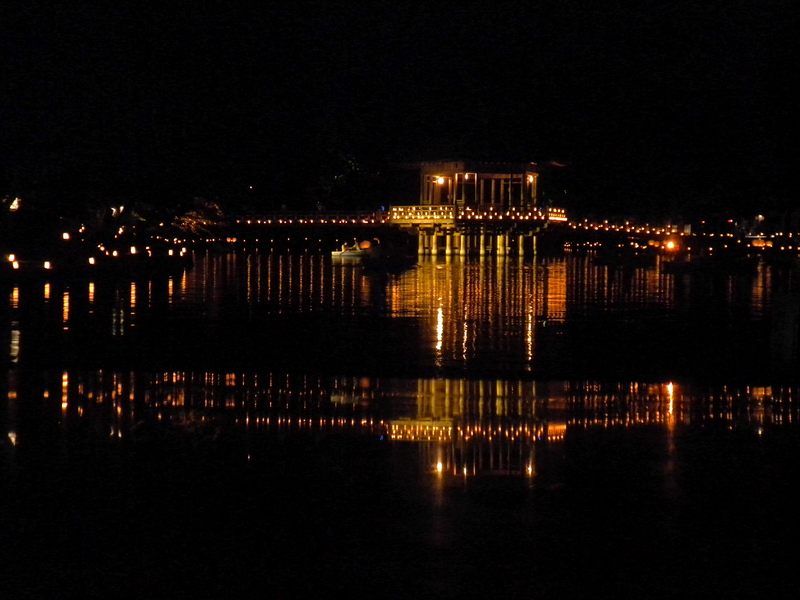 There were lanterns everywhere, but the big spectacle was a gazebo sitting over a lake in the park. All of the lights reflecting in the water were so pretty, and it was neat to see people in small boats cutting across the reflections. Jess separated from us and knelt next to a rock in order to take a few pictures. After a little while, a deer appeared out of the darkness and slowly made its way toward her. It was a curious little bugger and managed to stick its nose right into her face! The rest of us were laughing so hard when it happened. I suppose I should explain the deer. Nara is famous for the nearly 1200 wild deer roaming about 奈良公園 (Nara Kouen), meaning “Nara Park,” which encompasses nearly half of the city. The deer are allowed to do so, for according to legend, when Kasuga Taisha Shrine was founded as a family shrine for the Fujiwara clan (who were a big deal back in the 8th century), they invited a mighty god to come and reside in the shrine. The god supposedly agreed and came to Nara riding on the back of a white deer. Since then, deer are respected and protected as divine messengers. 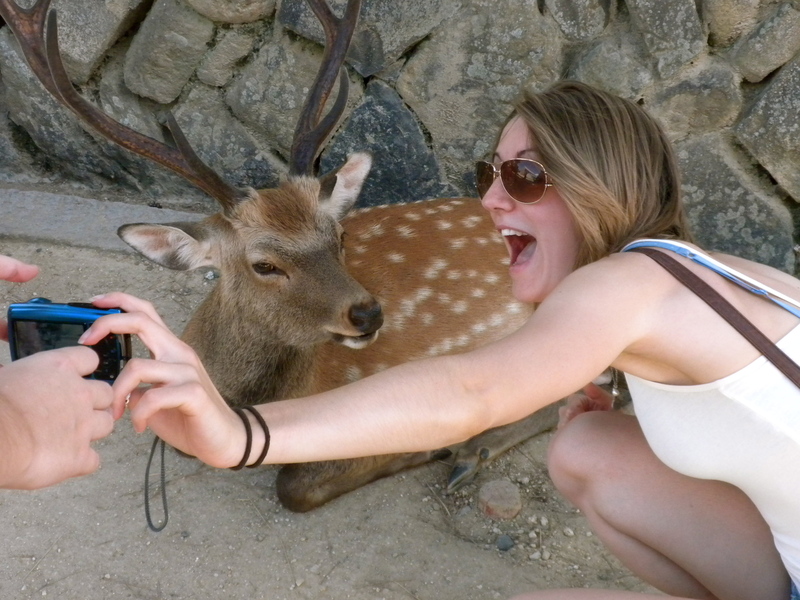 Don’t worry, though, for even though they’re wild animals they’re extremely tame — too tame, in fact. They’re quite friendly, and will come right up to you if they even catch a glimpse of you holding some food. It’s because they think you’re about to feed them! After the festival, we went back to the guest house and headed to bed. The next morning (August 7th) we paid the people who owned the guest house 500 yen each in order to rent bikes. Now, me riding a bike may not sound like much to you, dear readers, but it’s a big thing in my world. The last time I rode a bike was when I was eighteen and on a family bike trip somewhere in Eau Claire, Wisconsin. So, it had been six years since I last attempted biking! After a brief recap of how to start riding a bike, we were off to our first destination: 興福寺 (Koufukuji), also known as Kohfukuji Temple. This temple marked its 1300 anniversary of its founding in 2010 and is famous for its five-story pagoda, which is a symbol of Nara. After burning down five times, it was reconstructed in 1426. We found a lot of deer hanging out in the area, and quickly began a photo session with them. As we were hanging out with our new furry friends, a group of junior high school girls approached us and asked if it was alright to ask some questions in English, as a project for school. Being English teachers ourselves, who are we to say no? They posed the usual questions, such as “Where are you from?” and “Why did you come to Nara?”, and when we finished they handed me a small origami crane as thanks. 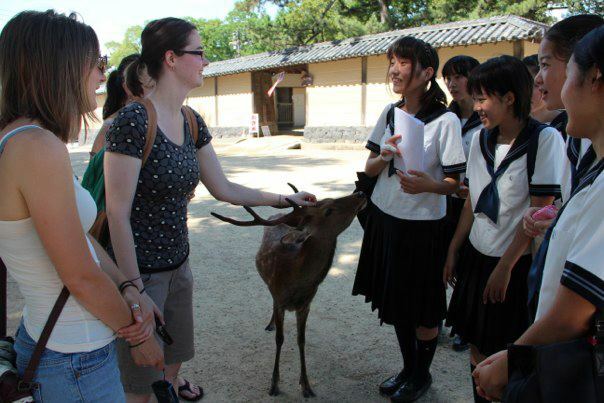 It was a really fun experience, because the entire time we were being interviewed, I was petting a deer! Only in Nara. The interview. Photo taken by Jess Damerst. The four of us went back to the lake we visited the previous night, and got to sit in the pavilion. Sitting in the shade was nice and cool, and a welcome relief from the strong morning sun. However, we had an entire day of exploring ahead of us so we moved to 春日大社 (Kasuga Taisha). There are two paths to the shrine, which sits on the eastern edge of the city, and they’re lined with approximately 2000 stone lantern. Beyond the shrine is the 春日山原始林 (Kasuga Yamagenshirin), or Kasugayama Primeval Forest. Hunting and logging in this forest was banned in 841, so this forest is a prime example of what primeval forest conditions were like in the past. Because of the hunting and logging bans, the forest is a sanctuary for a variety of protected species. We quickly explored the shrine, where Julie and I accidentally entered a forbidden area (the gate was wide open, which hid the sign saying we couldn’t enter). A shrine maiden hurried to us and spoke in broken English that we had to move, so we quickly complied. We got a neat picture out of the experience, though! 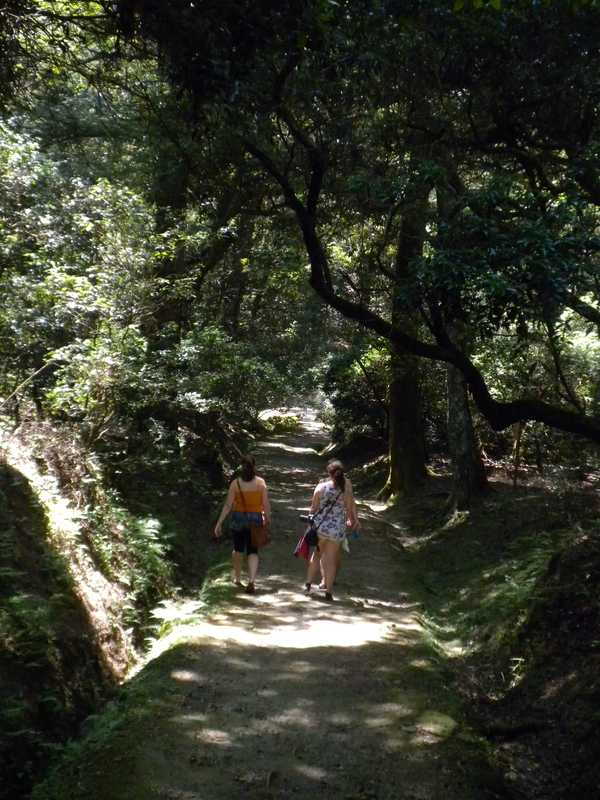 Next on our agenda was a small hike through the forest, in an attempt to visit another temple. 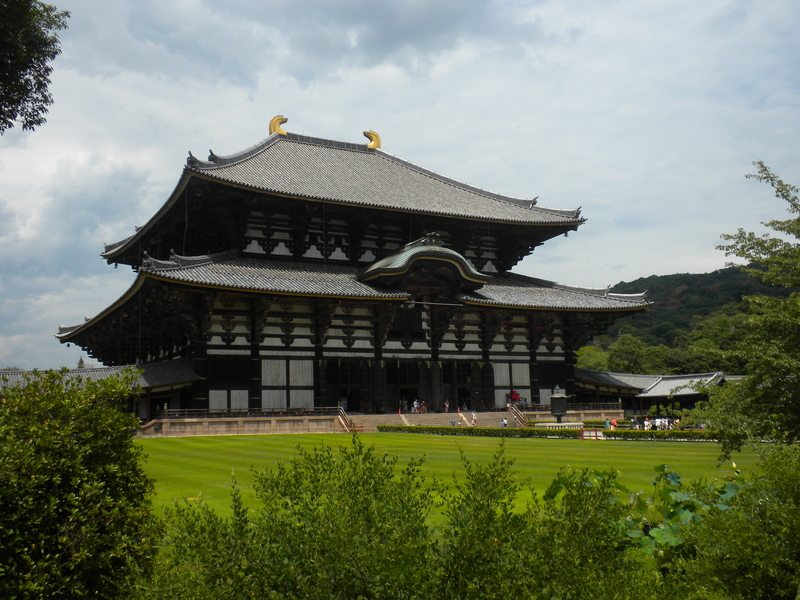 However, it was closed when we visited so we turned back and decided to instead go to one of Nara’s most famous sights: 東大寺 (Toudaiji), also known as Todaiji Temple. 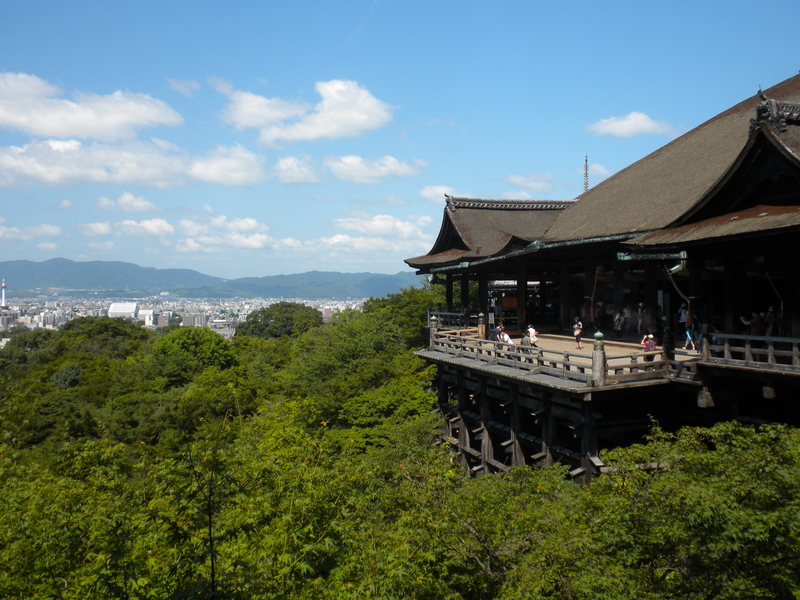 The temple was founded in the 8th century, and is the head temple of the Kegon sect of Buddhism. 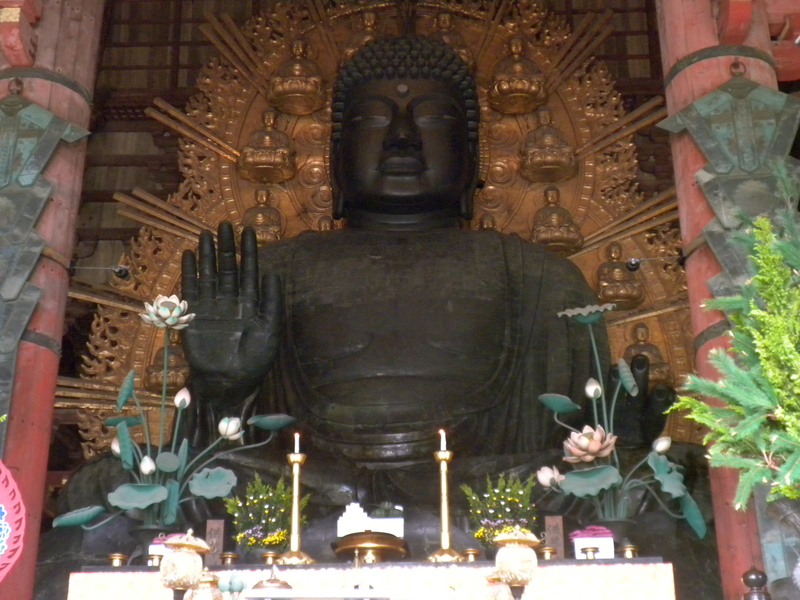 It contains an enormous statue of Vairocana, the “Buddha that shines throughout the world like the sun,” but the statue is simply known as 大仏 (Daibutsu), or “Great Buddha.” The statue was consecrated in 752, and various parts have been damaged and repaired over the following centuries. It’s made of cast bronze, but then plated with gold. The hall that houses the statue burned down twice as a result of war, once in 1180 and once in 1567. The present structure was rebuilt in 1709, and is 48.74 meters (159.89 ft) tall. It’s actually scaled down to two-thirds of the hall’s original size still is the largest wooden structure in the world! We had a long day of biking, but I survived and didn’t crash once! I’m actually pretty proud of this fact. We returned to the hostel to return the bikes and pick up our luggage and got on the train to Kyoto. I managed to convince the others that we should stop in Uji along the way, mostly because it’s famous for the 抹茶 (maccha) it produces! Unfortunately, the shop I wanted to go to was closed, but as we walked down the road an older couple stopped us and asked where we were going. Since we didn’t have a set destination within Uji, they took us to see a show of how fishermen use cormorants to help fish. They utilize the birds’ natural throat pouch by tying a rope around their necks. This way, the birds will swallow the fish into their pouches, but the fish won’t slide all the way into their stomachs. It was fun to watch, even though the sun set during the display. Our guides were really nice and it’s thanks to them that we saw such a neat thing! The four of us got on the train the rest of the way to Kyoto, and headed to Gion to where our hostel was. I was extremely excited to finally be back in Kyoto, and I had some trouble sleeping that night just because I was so excited for the next day! Obviously trying that sort of thing nowadays is banned. After shopping a little while in the shops lining the road leading the temple, I left Jess, Becky, and Julie in order to meet Sparling-sensei, one of my Japanese professors from Carleton, for lunch. It was wonderful to see her again, and we enjoyed passing the time eating lunch at one restaurant and immediately following it up with cold chai tea lattes at a coffee shop nearby. However, I had made plans to be at 同志社大学 (Doshisha Daigaku), where I studied abroad two years ago, in order to visit whoever might be in the Associated Kyoto Program (AKP) Office. When my time in the AKP Office was up, I decided to visit some of my favorite shrines on my own and then took the bus to meet the girls back at the hostel. We did a load of laundry at the hostel and relaxed. While we were there, we met two lads from England who are currently teaching English in South Korea. 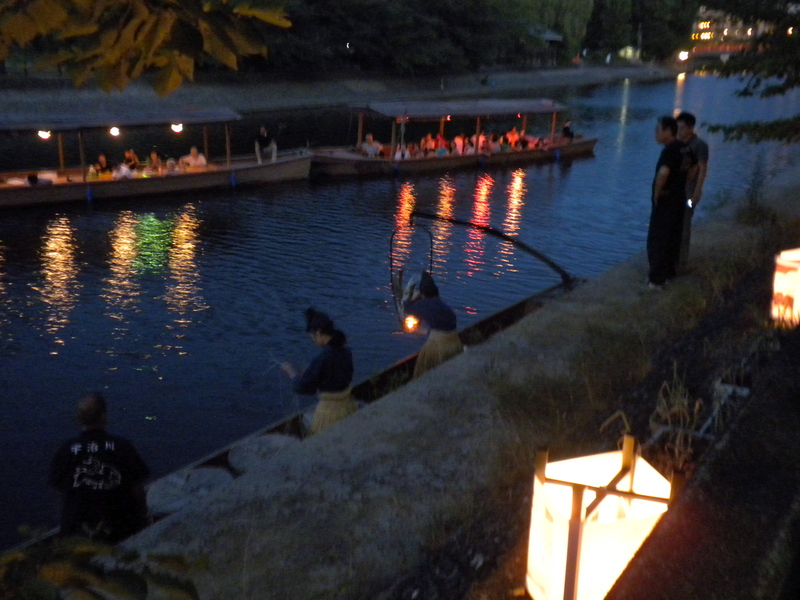 We invited them to join us for dinner and to explore the 七夕祭り (Tanabata Matsuri) that Kyoto was holding. We walked along the west bank of the 鴨川 (Kamogawa), or “Kamo River,” for an illumination, but then took the train towards Nijo Castle in order to walk north along the 堀川 (Horikawa), or “Hori River,” for the illumination there. It was absolutely beautiful, as we were greeted with blue balls of light toward us as we walked upriver. 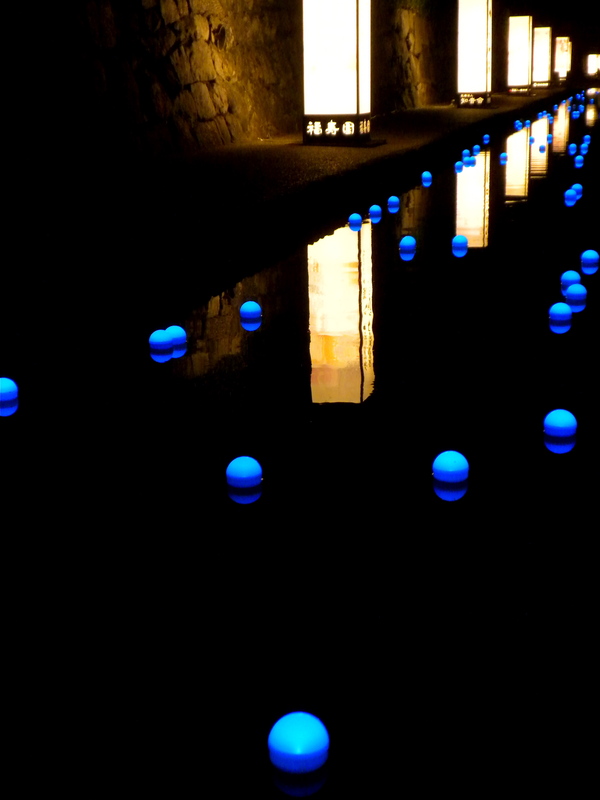 We walked along the river for nearly an hour and a half, before the illumination ended. 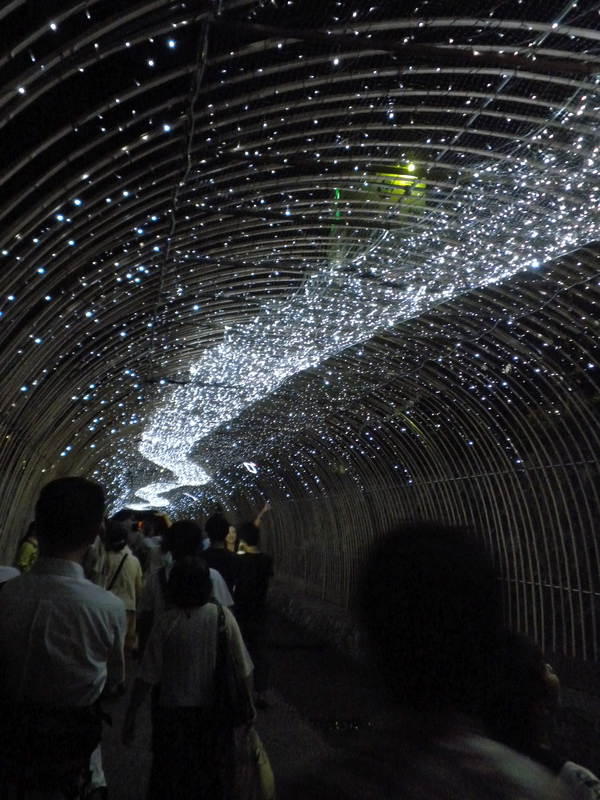 The grand finale was an amazing tunnel made to look like the Milky Way. The six of us decided that we wanted to go to a karaoke place, so I took them to Shijo to the karaoke place that my friends and I often went to when we studied abroad. When our time was up, we headed back to the hostel and to bed. 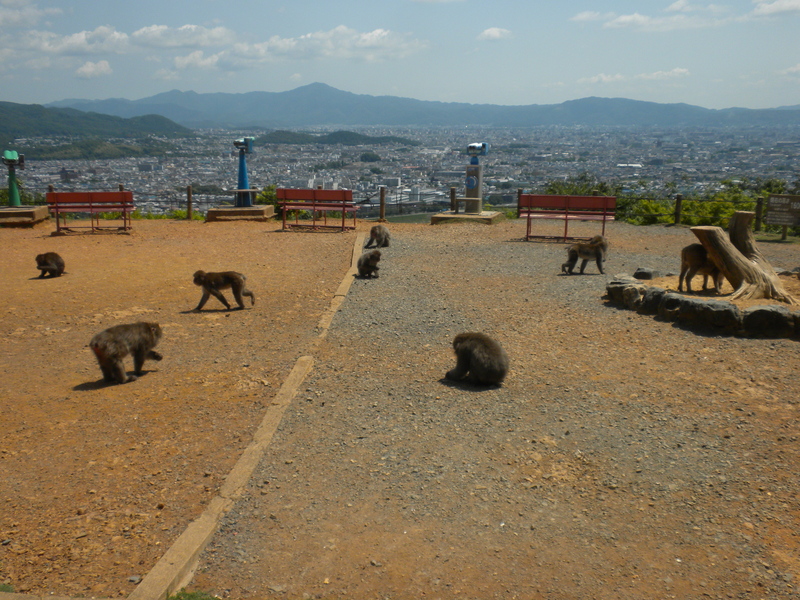 We had a bit of a late start the next morning, but soon headed to 嵐山 (Arashiyama), to see the Monkey Park. The park is situated on the mountainside, and you have to hike about twenty minutes or so to get there. It was my third time visiting the park, but there was something new that took residence in the park between my last visit and the most recent one. Can you see where it is? If you’ve given up, take a look on the right hand side of the picture. There. next to the stump. See it? 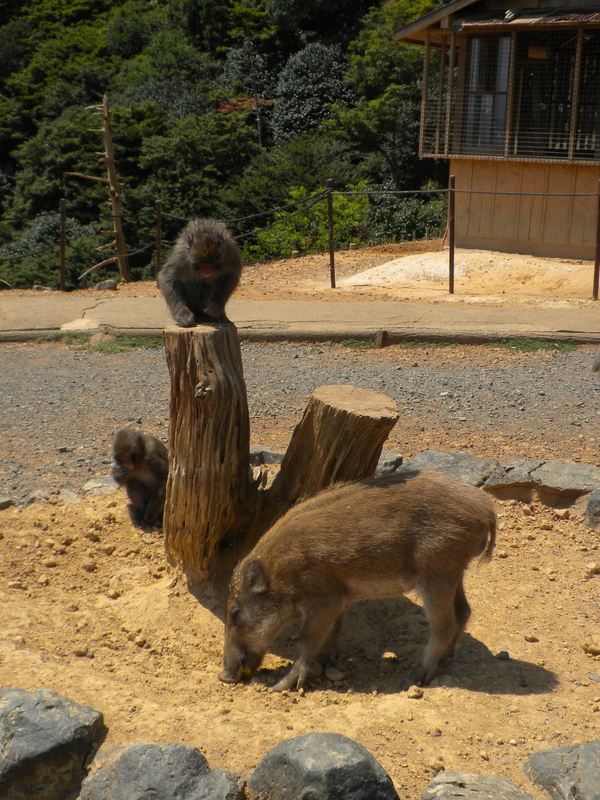 That’s a young boar that appeared in the park about a year ago, according to one of the park employees. They suspect that it got separated from its mother and wandered around a bit before showing up at the park. Now it lives with its new monkey family! There’s a building at the monkey park that’s screened on three sides so visitors can feed the monkeys without getting attacked. It’s amazing to see how monkeys young and old will determinedly shove their hands through the holes in the fencing in order to be fed. I bought a package of peanuts to feed the monkeys, and I did my best to make sure that all of the monkeys that came to my side got at least one or two peanuts each. 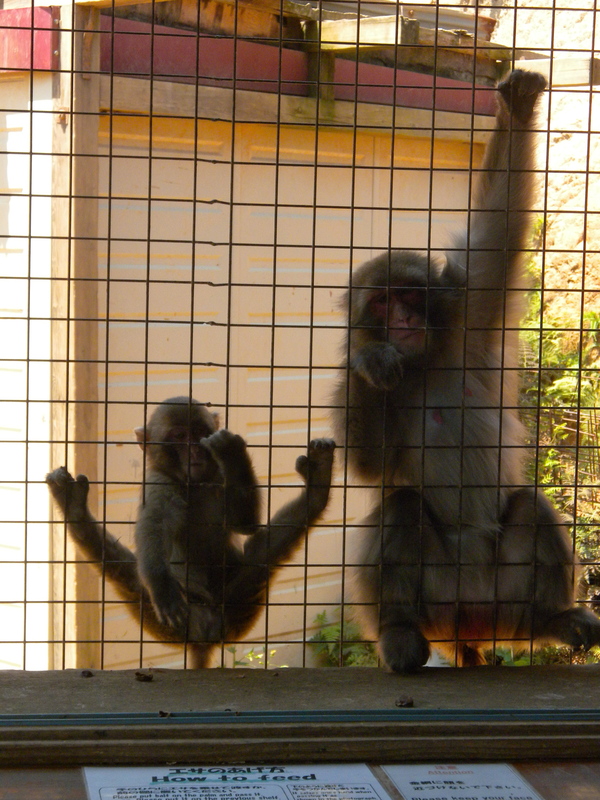 However, some monkeys tried to budge others out of the way, which resulted in screaming and baring of teeth. It was pretty interesting to watch, and I was relieved that the screen was solidly in place. Once we had our fill of monkeys, we hiked back down the mountain and crossed the river to walk down the Bamboo Road, which is a famous sight in Kyoto. 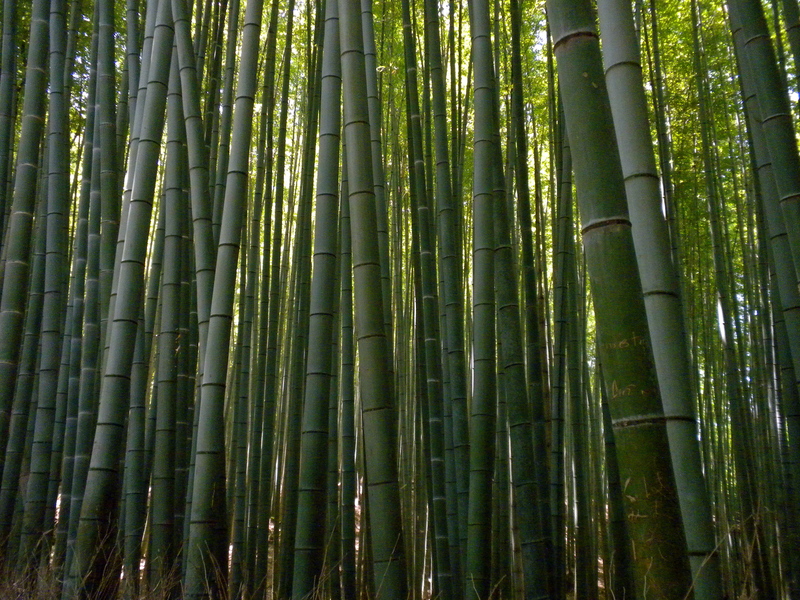 It’s once of those places you can visit again and again and never get tired of, because of how the bamboo changes with the seasons. This was my first time visiting in the middle of summer (I had been when it was wintertime and springtime), and I was more than happy to see how green everything was. We still had another place we wanted to visit before we needed to catch our Shinkansen (the bullet train) back to Tokyo that evening, so we walked to the train station and made our way towards another of my favorite parts of Kyoto: 伏見稲荷大社 (Fushimi Inari Taisha), or “Fushimi Inari Shrine.” The shrine is situated going up a mountainside, with the entrance at the base of the mountain and a path winding its way up the mountain leading to dozens of smaller shrines. 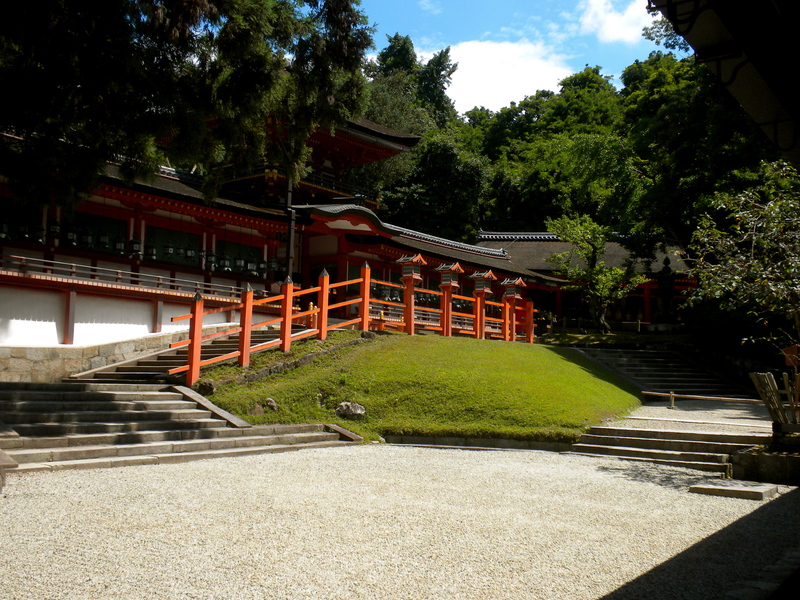 The main shrine is dedicated to Inari, the deity of fertility and agriculture. Some accounts refer to Inari as male, while others say Inari is female. It all depends on the region of Japan, really. I highly suggest looking more into this particular deity, just because s/he is so interesting! 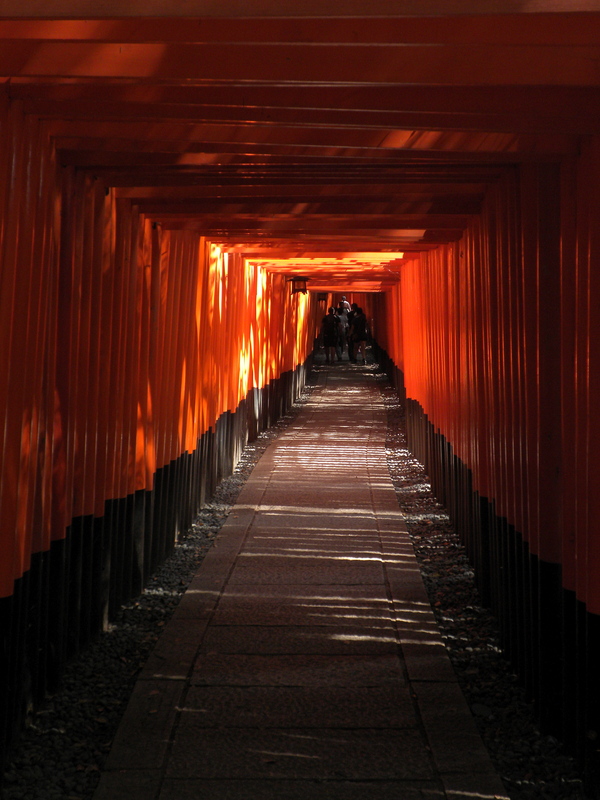 Fushimi Inari Taisha is most famous for a tunnel created from thousands of orange gates. It’s beautiful no matter what time of day you visit, but I love visiting when the light hits the area just right and the entire tunnel glows. It’s the experience of going through the glowing tunnel that makes Fushimi Inari Taisha one of my most favorite places in Kyoto. We hiked up the side of the mountain, but somehow ended up following paths that took us off the map. As a result, we ended up losing a little bit of time as we figured out where we were. In the end, we had to cut our hike short in order to return to the hostel, collect our things, and get to Kyoto station in order to get on the Shinkansen. All in all, I had a wonderful time revisiting the Kansai area since I had the chance to see familiar places and discover new ones all at the same time. I definitely hope that I get the chance to make my way down there again soon! Coming up: A post about my baby sister coming to visit me and our hike up Mt. Fuji! Stay tuned.